This old French saying seems like someone talking out of both sides of their mouth. Someone who is confused and not making sense. Changing but staying the same. What does that even mean? As election day is upon us, I can tell you what I think that means. History will be made today no matter who wins the Presidential election. Either someone with no formal government experience will be president or the first female president will be elected. The sentiment across America seems to be one of fear for whoever will be in charge. Things are changing in America. God is on the throne, folks. The more things change, the more GOD stays the same. And when we all realize that, this country will be great again. 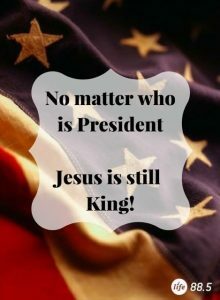 This entry was posted on November 8, 2016 with tags: election, Jesus, president, vote by Deanna Young.